ABSTRACT: This paper considers some of the issues involved in the analysis of rhythm and meter in electronic dance music. It begins by considering metrical dissonance and ambiguity within the context of a layered approach to musical meter; it also highlights some of the distinctive ways in which these phenomena are manifested in this repertory. The second half of the paper focuses on the use of asymmetrical patterns in electronic dance music and considers some broader questions of rhythmic and metrical theory. Throughout, the paper draws upon a number of different music-theoretical sources, including work by Harald Krebs, Jay Rahn, and Christopher Hasty, as well as scholarship in ethnomusicology and cognitive science. Within the past decade, music-theoretical analysis of popular music has become increasingly common. Nonetheless, until quite recently the purview of such research has been relatively limited, focusing mainly on classic and art rock from the 1960s and 70s. While these repertoires have provided fertile ground for analytical exploration, several more recent genres and styles raise interesting structural, semiotic, and aesthetic questions that also merit study. One of the most distinctive types of contemporary popular music is electronic dance music, a broad category that includes styles such as techno, house, drum-n-bass, and trance. (1) Electronic dance music differs from both rock and art music in a number of ways, all of which suggest avenues for productive theoretical investigation. While many genres of popular music are distinguished from each other on the basis of “surface” differences such as instrumentation or lyrical content, electronic dance music presents a distinctive overall formal structure in addition to its characteristic instrumentation. It also differs from most other types of Western music in its rejection of harmony as a primary musical parameter. Its use of pitch is typically restricted, with the majority of musical development taking place instead in the realms of rhythm, meter, texture, and timbre. Consequently, these areas should be principal concerns for the analyst wishing to pursue a close examination of musical sound in this repertoire. Rhythm provides an ideal starting point, as it seems to be the element to which listeners and fans of EDM relate most directly. This connection is most immediately apparent on the dance floor, where audiences physically enact the rhythms of the music. Written discussions of electronic dance music also tend to highlight its rhythmic qualities—references to its “unrelenting rhythm,” “pulsing dance rhythms,” and “irresistible tribal rhythm” are common(2)—and fans often refer to the music simply as “beats” (as in, “let’s go to the club and hear some beats”). Yet EDM poses a challenge to the analyst, for it differs in many ways from the repertoires that current music-theoretical models of rhythm and meter were developed to address. Transcription can give the impression that it is less complex rhythmically than these other bodies of music: although it typically consists of many different textural layers, each of which has a different rhythmic pattern, these patterns can appear quite simple when considered individually, and they repeat for long periods of time without changing. Nonetheless, the experience of listening to electronic dance music is neither simple nor monotonous, for it engages one’s perception of rhythm and meter in a number of interesting ways. In this paper I will examine some of the issues involved in the analysis of rhythm and meter in this repertoire. In the first half of my paper, I will consider metrical dissonance and ambiguity within the context of a layered approach to musical meter. The discussion, which will be centered upon several short musical examples, will also highlight some of the distinctive ways in which these phenomena are manifested in EDM. The second half of my paper will focus on the use of asymmetrical patterns in EDM. Though this section will begin with two musical examples, it will develop into a more general discussion focusing on broader questions of rhythmic and metrical theory. Throughout the paper I will draw upon scholarly work in a number of different fields, including music theory, ethnomusicology, and cognitive science. Let us first consider a brief musical example, an excerpt from the song “Piku” by The Chemical Brothers. At the beginning of this example, two distinct textural layers, defined by timbre and by rhythmic patterns, are audible; they are not aligned, however (Example 1a). Accents are created by register in the synthesizer pattern and by attack-point spacing in the percussion part, thus suggesting two different streams of quarter-note pulses. This state of nonalignment continues for about thirty seconds. Although the balance between the two parts changes as the example unfolds, neither beat pattern stands out clearly as the dominant one. Thus one can easily shift attention from one pattern to another, so that the figure/ground relationship between the two patterns reverses. (3) In fact, the reader is encouraged to do so while listening to the example. A displacement dissonance occurs when an interpretive layer sounds like it is displaced from a metrical layer; the conflicting layer is called the antimetrical layer. Since electronic sound production facilitates this sort of nonalignment, it is not surprising that it is a frequent source of metrical dissonance in EDM. In Example 1a, a sixteenth-note pulse layer is grouped by two different patterns moving in quarter notes. This excerpt differs from most of Krebs’ examples, however, because it is in a certain sense prior to meter; there is no larger layer grouping the quarter notes into measures. This heightens the ambiguity of the example: it is unclear which layer is metrical and which is antimetrical. (7) If we decide to focus on the synthesizer pattern, then we hear the snare drum being displaced by three sixteenth notes, a dissonance that Krebs would describe as D4+3. (8) On the other hand, if we attend to the snare drum pattern, then we hear the synthesizer as displaced by a single sixteenth-note, or D4+1. Both of these possibilities are summarized at the bottom of Example 1a. According to Krebs, the closer a dissonance is to a state of alignment, the greater the intensity of its dissonance. In this example, then, either possibility creates a rather strong dissonance. If the layers were displaced by two sixteenth notes, however, the dissonance would be less intense; furthermore, there would be less opportunity for reinterpretation. Example 1b, another excerpt from “Piku,” begins in the same place as the previous example but continues further into the song. I suggest listening to the example apart from the transcription at first; as before, try to experiment with different figure/ground relationships, and note the nonalignment of the layers. In this example, the entrance of a new layer resolves a metrical dissonance. In other cases, such an entrance may actually create a metrical dissonance. For example, at the beginning of the song “Cups” from Underworld’s 1998 album Beaucoup Fish, the synthesizer pattern clearly begins on the downbeat of a 44 measure, as shown in Example 2a. This hearing is soon confirmed by a cymbal pattern articulating a quarter-note pulse. After about fifteen seconds of the synthesizer pattern, however, a loud drumbeat comes in with a different pattern, whose entrance is offset from the previously established measure by a single eighth note. If one focuses on this drumbeat, it is possible to hear the beat pattern shift, so that the synthesizer and cymbal patterns now seem to occur on offbeats. As shown in Example 2b, the repetition of these patterns suggests a D8+1 displacement dissonance. At this point, though, the evidence for this hearing remains inconclusive; conservative listeners may not be willing to give up the initial metrical framework just yet. (10) The displacement becomes definitive, however, after the first eight bars of the drumbeat, when a new synthesizer pattern begins to reinforce the downbeat of the drumbeat pattern (Example 2c). Another example of metrical dissonance in rock is provided by John Covach, who discusses the presentation, development, and eventual resolution of a metrical dissonance across the course of Yes’s song “Close to the Edge.”(12) Examples of metrical dissonance are also easily found in jazz. (13) For the purposes of the present discussion, then, the significance of these metrical phenomena lies not in the mere fact of their occurrence in electronic dance music, but rather in the distinctive ways in which they are used. For instance, consider how the metrical dissonances described above are situated within the larger works of which they are a part. In the EDM examples, metrical dissonance almost always occurs as part of a process unfolding continuously in real time. In comparison, in the examples discussed by Headlam and Covach, related metrical dissonances are generally separated from each other temporally, sometimes by rather considerable distances (for instance, the time interval between the second and third appearance of the dissonance in “Close to the Edge” is approximately 9 minutes). After their initial presentations, their implications and inherent tensions are developed in various ways, as might occur with a motive in a Classical work. (14) The exploration of motivic possibilities is also a well-known feature of jazz improvisation, and Cynthia Folio’s examples can be understood in these terms. (15) In electronic dance music, on the other hand, the emphasis is not so much on the long-range exploration of a motive’s possibilities as it is on producing an immediate and striking effect—either to create a point of formal articulation (as in Example 1b, in which the resolution of the opening metrical dissonance coincides with the beginning of the work’s first groove), or to introduce an element of surprise (as in Example 2, in which an otherwise straightforward textural buildup is complicated by the introduction of a displacement dissonance). Furthermore, while the types of metrical dissonance discussed by Krebs can occur in many different repertoires, they are particularly relevant to electronic dance music for a number of reasons. As discussed above (paragraph 5), the Yeston/Krebs model conceptualizes meter as the union of several layers of motion. As in the music of Robert Schumann (the composer upon whom Krebs has focused most extensively), these layers are particularly clear in electronic dance music. They often appear as discrete elements of the texture, individuated by timbre, register, and pattern repetition. For instance, in a 44 meter, one might find one part of the texture articulating a quarter-note pulse, another moving primarily in eighth notes, and a third emphasizing the whole-note layer, with each element being registrally and timbrally distinct. Dissonant layers usually stand out clearly as well. The situation just described might not seem all that unusual in and of itself. In electronic dance music, however, this layered approach to metrical construction is further emphasized by the relative equality of its textural layers. No single voice dominates the texture: in contrast to the vast majority of commercial popular music produced in America and Europe since the advent of rock-n-roll, EDM is not vocal music; in general, its only verbal elements are short, fragmentary samples. (16) Neither does it replace solo voices with instrumental ones: unlike a great deal of classical (and other) instrumental music, it does not as a general rule employ melody-and-accompaniment textures. Layering is also absolutely essential to the way electronic dance music is recorded and performed. In the studio, EDM is produced in a multi-channel environment, which allows all of its sound sources to be controlled independently, so that layers of motion can be combined in a variety of interesting ways. Of course, this technology is not limited to EDM; in fact, it is commonplace in contemporary popular music. In most pop traditions, however, audiences expect performers to be able to produce reasonable facsimiles of their recordings in live performance, a factor that may limit the complexity of metrical dissonance. This is not the case in EDM, though. In this repertoire, a completely different tradition of live performance exists, one in which DJs, rather than studio artists, take center stage. (17) For the most part, records are treated not as finished products but as raw material for manipulation by the DJ. While the music that one hears at a nightclub or a rave originates in the studio, records are rarely heard in their original studio-produced forms. Instead, they are manipulated and combined with other records in a real-time process that produces substantially different compositions. The DJ uses turntables to play two or more records at once and a mixing board to control the balance between the records (one record is usually more prominent). The mixing board also allows the DJ to control the high, middle, and low range of each record, which makes it possible to manipulate layers within as well as between records. This capability facilitates the real-time creation of displacement dissonances like those seen in Examples 1a/1b and 2 (which are taken from studio-produced recordings). For instance, reinterpretations (cf. Example 2b) can be created by playing a pattern such as that found in Example 2a on one record, then bringing in the bass drum of another record on the offbeats. The lower, more resonant bass drum sound “turns the beat around,” but the first pattern persists, thereby producing a displacement dissonance. Conversely, given a situation like that of Example 2c, the DJ might use the high- and low-range controls to remove the bass drum and high synth pattern, thus calling a seemingly clear metrical interpretation into question. This type of ambiguity also figures prominently in electronic dance music. As an example, let us consider another track by Underworld. This song, entitled “Moaner,” begins with a drumbeat articulating a steady quarter-note pulse; between these beats, a synthesizer plays three sixteenth notes, as shown in Example 3a. It seems probable that the drumbeat, being louder and longer in duration, would play the primary role in determining the accentual pattern. The synthesizer sound also attracts attention, however, by changing timbrally and dynamically, while the sound of the drumbeat does not vary. As one focuses on the synthesizer sound, one can hear an accent on the second sixteenth note of the pattern, as shown in Example 3b. It is also possible to hear an accent on the third sixteenth, as seen in Example 3c. This last hearing begins to be especially noticeable after about fourteen seconds of the song. At this point, the timbre of the sound begins to change, as a process called a filter sweep, which gradually begins to emphasize the upper partials, is applied to it. The sound crescendos at the same time. Underworld also draws attention to the sound changes by altering the drum pattern very slightly just before the changes begin. In a sense, the interpretations shown in Examples 3b and 3c create displacement dissonances with the drumbeat. These dissonances differ from the one heard in Example 2c, however, since they are created by the reinterpretation of an already-sounding pattern, rather than by the entrance of a new pattern. As such, they are inherently more fragile: if one focuses too much on the drumbeat, the new interpretations of the synthesizer pattern seem to fade away. In addition to highlighting the ambiguity found in these examples, I have tried to emphasize the way that accentual and/or metrical interpretations evolve or emerge while one listens to them. In this respect, I am inspired by the work of Christopher Hasty and Gretchen Horlacher, who have captured this quality of musical experience very effectively in their approaches to meter. For instance, Hasty writes that “a piece of music, while it is going on, is incomplete and not fully determinate—while it is going on, it is open, indeterminate, and in the process of becoming a piece of music.”(21) The processual quality that Hasty describes is particularly noticeable in electronic dance music. As in minimalist and other types of repetitive music, processes unfold very gradually in EDM. Patterns are repeated for long periods of time. For example, in “Moaner,” the patterns heard in Example 3 repeat almost constantly throughout the length of the song—approximately 7½ minutes. Such repetition is an asset in minimal music,(22) since it gives the listener time to rehearse different rhythmic interpretations. Although other sounds enter throughout the course of the song, masking the original, accentually indeterminate pattern, it continues to be heard beneath the surface, giving the entire song an aura of instability. We have now heard several examples of the rhythmic and metrical phenomena that occur in electronic dance music, including displacement dissonances and various types of ambiguity. In the next portion of this paper, I will focus on another feature—namely, the use of asymmetrical patterns. Although I will begin by looking at two musical examples, the majority of my discussion will focus on certain broader questions of rhythmic and metrical theory. I will highlight the issues raised by EDM’s asymmetrical patterns and will suggest some approaches that are particularly useful for dealing with them. All of the examples considered thus far have contained layers of steady quarter-note or half-note motion (even though the metrical context of these layers was not always clear). However, while electronic dance music often features even rhythms very prominently, this is not always the case. For instance, in the track “Compression” by Everything But the Girl, a prominent drumbeat repeats the pattern quarter-eighth/quarter-eighth/quarter throughout. Timbral changes within the pattern suggest divisions after each of the eighth notes, and almost all of the rhythmic patterns in the track reinforce this 3+3+2 division; the only exception is the triplet pattern played by Synthesizer 1, which occurs at a low dynamic level. (See Example 4, a–e.) Thus there is very little to suggest a quarter-note pulse in this track. A 3+3+2 pattern (again divided into quarter-eighth/quarter-eighth/quarter) also underlies much of Underworld’s “Pearls Girl” (though the variable fourth measure departs from this organization). Patterns that divide a measure asymmetrically occur in a number of different repertories, including folk music of the Balkans and drum ensemble music of sub-Saharan Africa. In some cases, especially in the former repertory, the number of pulses in the measure is a prime number, which means that the beat patterns comprising the meter must be irregularly spaced. In electronic dance music, however—as in much African percussion music—the measure contains a nonprime number of pulses. (23) This makes it considerably more difficult to determine the meter when asymmetrical patterns are prevalent, since the measure can also be divided evenly. Should the recurring asymmetrical patterns be considered metrical, resulting in meters such as 3+3+2/8 or 3+3+3+3+4/16, or should they be treated as syncopations against a regular background? In addressing this question, it is useful to see what scholars of African music have to say, as some of them have given considerable attention to the issue. (24) Thus in the next few paragraphs I will focus primarily on their arguments, though I will also relate their observations to electronic dance music. In general, Africanists’ opinions on meter and asymmetrical patterns seem to fall into two different schools of thought. On the one hand, scholars such as Robert Kaufmann argue that regularly recurring asymmetrical patterns can become metrical, so that they do not seem syncopated. (25) In such cases, notes that would be accented in a 44 meter might sound syncopated in a meter such as 3+3+2/8. For instance (returning for the moment to EDM), in Example 4b the third note of the Synthesizer 1 part, which would fall on a half-note beat in 44 time, would be syncopated if the beats follow a 3+3+2 division. Likewise, Jay Rahn argues with respect to African music that “one might like to determine how such syncopated patterns can be considered ‘rhythms of reference’ and whether there is any sense in which they can be viewed as regular. Rather than describing these patterns negatively (e.g., as deviations from a divisive organization), perhaps one can discern positive features in their structures.”(36) To this end, he has explored the special properties of these rhythms. In fact, Rahn is one of a number of writers whose work suggests alternatives to grid-based views of asymmetrical patterns. In the rest of this section (paragraphs 30–36), I will explore three of these alternatives. It is not my goal in discussing this research to suggest an all-encompassing model of asymmetry (or, more generally, of rhythm and meter) in electronic dance music, for much additional research would needed before such a model could be proposed. I believe, however, that the approaches of these authors will suggest some ways in which the construction of a broader model might proceed. The properties cited by Rahn suggest possible reasons for the special presence of the asymmetrical patterns that occur in electronic dance music—the way in which they seem to stand on their own apart from any metrical grid. For instance, attacks within maximally even asymmetrical patterns are almost as regular as metrical beats. Because of the slight irregularities of these patterns, however, each attack has a unique relationship to every other attack, which is not the case in completely even rhythms. These structural features distinguish this type of organization from that of meter, even though the rhythms produced by diatonic organization can coexist with a variety of metrical structures. As the foregoing discussion has shown, the approaches of Rahn, Handel, and Hasty each provide a distinctive contribution to our understanding of the asymmetrical patterns that occur in electronic dance music. Rahn provides a structural account of the special characteristics of these rhythms, while Handel and Hasty focus more on issues of perception. Handel suggests an alternate mode of hearing that may play a role in the cognition of such patterns; Hasty, on the other hand, applies the same perceptual principle (projection) to all meters, while also showing the unique ways it plays out in irregularly spaced meters. While there are obvious differences between these approaches, they should not be considered mutually exclusive. For instance, although Rahn and Handel, unlike Hasty, preserve a separation between rhythm and meter, their respective emphases (structural properties and figural hearing) could still be situated within Hasty’s method. (49) Likewise, Hasty’s discussion of projection could be applied to asymmetrical patterns even if those patterns are not considered strictly metrical. In fact, I would ultimately conclude that such patterns are not generally metrical in electronic dance music (given that they usually occur in conjunction with regularly spaced patterns that can be heard as metrical more easily). (50) Nonetheless, I would argue that they should not be treated as transient foreground phenomena superimposed onto an underlying regular structure. Rather, as these three methods show us, these rhythms have a distinctive presence of their own and should be considered structurally significant in their own right. Our exploration has shown a variety of ways in which rhythm and meter are used to create musical interest in electronic dance music. Displacement dissonances subvert metrical stability; inherently ambiguous patterns encourage multiple interpretations; and asymmetrical patterns counteract the regularity of persistent even rhythms. The common link between all these phenomena is an emphasis on interpretive multiplicity. In other words, electronic dance music encourages us to hear it in a variety of ways. As we have seen, this multiplicity functions on many different levels. Individual patterns are often intrinsically ambiguous. Furthermore, they frequently remain so even when used in combination: when there is no definitive metrical layer, the distinction between metrical and antimetrical layers may not be apparent. Even when all the elements of a meter are in place, reinterpretations can turn the beat around, showing the listener that the metrical structure was not quite what it seemed to be. And finally, the persistent repetition of both asymmetrical and even patterns encourages multiple perspectives on rhythmic and metrical structure, thereby undermining any sense that there is a singular structure underlying the music. In spite of these conclusions, a number of questions remain. First, how might the instabilities and ambiguities that I have discussed be played out on a larger scale? In what ways do EDM musicians create subtlety in a work as a whole? What sorts of processes occur during the course of complete tracks, albums, and DJ sets? Second, how widespread are the phenomena considered here, and how broadly applicable are the approaches put forth to the various genres of electronic dance music? (51) Third, since EDM is first and foremost dance music, what is the relationship of dance to these rhythmic and metrical phenomena? Each of these questions is a potentially vast topic unto itself, and further research is needed before definitive answers can be given. Instead of trying to answer these questions at this time, I will leave them for future studies of electronic dance music to address. (52) Nonetheless, I believe that these issues, in combination with the phenomena already discussed, suggest something of the range and complexity that electronic dance music offers to listeners and scholars, both within music theory and without. An earlier version of this paper was read at the Eleventh Biennial Symposium of Research in Music Theory, Bloomington, Indiana, February 25, 2000. I would like to thank all those who have read and commented on the paper, including the two anonymous reviewers, Gretchen Horlacher, Harald Krebs, Eric McKee, Jeffrey Magee, Felicia Miyakawa, and Tanner Menard. Juan Atkins. WaxTrax! MasterMix Volume 1. Chicago: WaxTrax! Records, 1998. CD. 808 State. Cubik. New York: Tommy Boy Records, 1990. CD single. The Chemical Brothers. Dig Your Own Hole. New York: Astralwerks, 1996. CD. Everything But the Girl. Temperamental. New York: Atlantic, 1998. CD. Underworld. Beaucoup Fish. New York: V2 Records, 1998. CD. ________. Second Toughest in the Infants. Chicago: WaxTrax! Records, 1996. CD. 2. These particular quotations are taken, respectively, from the following articles in the Detroit Free Press describing the 2001 Detroit Electronic Music Festival: David Lyman, “Detroit Dance Fever,” 28 May 2001, C6; Brian McCollum, Tim Pratt, and Tamara Warren, “Techno and Torrents in Hart Plaza,” 28 May 2001, C6; and Brian McCollum, “Unbeatable,” 29 May 2001, D3. 3. Similar ambiguities have been explored by the psychologist Stephen Handel, who has studied the cognition of polyrhythms such as two against three, two against five, and so on. In a series of experiments, Handel and co-researcher James Oshinsky played selected polyrhythms for listeners and asked them to tap along with what they perceived to be the beat; their results suggest that certain combinations encourage a variety of beat placements. See Stephen Handel and James S. Oshinsky, “The Meter of Syncopated Auditory Polyrhythms,” Perception and Psychophysics 30.1 (1981), 1–9. 4. Harald Krebs, Fantasy-Pieces: Metrical Dissonance in the Music of Robert Schumann (New York: Oxford University Press, 1999), 33. Krebs describes the type of polyrhythm discussed by Handel as a grouping dissonance. This type consists of layers whose cardinalities differ (for instance, a 3-layer against a 5-layer), whereas a displacement dissonance always involves two or more layers of the same cardinality (ibid., 31). 5. Maury Yeston, The Stratification of Musical Rhythm (New Haven: Yale University Press, 1976). 6. Krebs, Fantasy-Pieces, 2, 30. 7. Krebs does refer very briefly to such a situation, noting that “where there is no metrical framework, the layer initiated earlier usually functions as the referential layer” (ibid., 261, n. 20). While this principle seems plausible, it remains hypothetical within the context of Krebs’s book, as none of his examples fall into this category. Even if we do accept it, it is difficult to apply in this case, as both layers begin almost simultaneously and at a low volume. Krebs has concurred with my assertion that selective attention can change which layer functions as referential in this example (personal communication, May 2000). 8. Krebs believes that most displacement dissonances are heard as forward displacements; thus, he usually expresses them with positive numbers—for example, D4+3 rather than D4-1 (ibid., 35–36). In this example, since there is no definitive metrical layer, this distinction is not especially relevant. 9. At the same time, the increase in metrical consonance is counterbalanced by the syncopation of the new pitch pattern. Interestingly, if any other note within this pattern were taken as the downbeat, it would be considerably less syncopated; one such rearrangement is shown in Example 1c. Such a move, however, would shift the percussion parts onto weak sixteenth-note beats. It would be quite unusual for the bass drum to be syncopated in this manner; when present, it tends to function as a source of metrical stability in EDM, most likely due to its status as the lowest and most resonant element in the texture. Research in music cognition supports this claim (for instance, Handel and Oshinsky found that when the frequency between metrically dissonant elements varies, listeners tend to choose the lower frequency as stable; see “Syncopated Auditory Polyrhythms,” 4), as does observation of EDM in performance (when played at a typical performance volume, the bass drum will be felt throughout the entire body). 10. Here I employ a distinction between conservative and radical listeners first suggested by Andrew Imbrie. (See Andrew Imbrie, “‘Extra’ Measures and Metrical Ambiguity in Beethoven,” in Beethoven Studies, ed. Alan Tyson [New York: Norton, 1973], 45–66.) When presented with conflicting cues, conservative listeners tend to hold onto previously established metrical interpretations for as long as possible, whereas radicals move on to new interpretations more readily. In Example 2b, a conservative hearing is supported by the lack of a strong downbeat orientation in the drumbeat pattern and by the fact that the articulations of this pattern occur on weak beats of the previously established meter; a radical hearing is supported by the previously mentioned tendency of low drumbeats to function as metrically stable in EDM (in contrast to cymbals, which usually function as backbeats) and by the fact that the drum pattern begins one eighth note before the synth and cymbal patterns (if the drum were the backbeat, its pattern would more logically begin on the “and” of beat one). 11. Dave Headlam, “Blues Transformations in the Music of Cream,” in Understanding Rock: Essays in Musical Analysis, ed. John Covach and Graeme M. Boone (New York: Oxford University Press, 1997), 73–79. Headlam does not use the term “displacement dissonance”; this application of Krebs’s terminology is my own. 12. See John Covach, “Progressive Rock, ‘Close to the Edge,’ and the Boundaries of Style,” in Understanding Rock 11–14. It should be noted, however, that Covach’s examples differ from those previously cited, in that (in Krebsian terms) they would be considered grouping rather than displacement dissonances. (As before, the application of Krebs’s terminology is my own rather than the author’s, though Covach does use the term “metric dissonance.”) While displacement dissonances are quite common in electronic dance music, grouping dissonances are relatively rare. 13. For instance, see Cynthia Folio, “An Analysis of Polyrhythm in Selected Improvised Jazz Solos,” in Concert Music, Rock, and Jazz since 1945: Essays and Analytical Studies, ed. Elizabeth West Marvin and Richard Hermann (Rochester, NY: University of Rochester Press, 1995), 103–34. Folio finds examples of both grouping and displacement dissonances (which she refers to as type A and type B dissonances, following an earlier usage of Krebs), as well as a third type (type C) involving out-of-phase tempos. 14. Cf. Covach, “Progressive Rock,” 14. 15. For the most part, however, Folio’s examples present a succession of distinct, short-lived dissonances, a feature that distinguishes them from Covach’s examples (in which considerable time intervals separate appearances of related dissonances) and from EDM (in which a single dissonance often repeats continuously for a long period of time). 16. There are a few notable exceptions to this trend: certain styles of house music feature vocals quite prominently; drum-n-bass/jungle DJs sometimes perform in conjunction with rappers (MCs); and “crossover” artists such as Moby are also more likely to utilize vocals. Nevertheless, the above statement holds true for the majority of electronic dance music; it is quite common to hear several hours worth of music at an EDM performance without encountering a single vocal. Furthermore, the exceptions to this phenomenon tend to push toward or be classified as other genres; for instance, certain performers are classified as crossover acts because their vocally driven songs are seen as moving toward the style and structure of radio-friendly pop. 17. DJs also play an important role in certain other genres, such as rap and turntablism. Rap in particular shares many aspects of EDM’s layered approach to musical construction, and layering has been emphasized in analytical approaches to rap as well. For instance, see Tricia Rose, Black Noise: Rap Music and Black Culture in Contemporary America (Hanover, NH: Wesleyan University Press, 1994); Robert Walser, “Rhythm, Rhyme, and Rhetoric in the Music of Public Enemy,” Ethnomusicology 39.2 (1995), 193–217; and Adam Krims, Rap Music and the Poetics of Identity (Cambridge: Cambridge University Press, 2000). Nonetheless, the absence of vocals, in combination with the more central role of the DJ, creates significant textural differences between EDM and rap. It should also be noted that live performances (generally called “live p.a.’s”) are becoming increasingly common in electronic dance music, especially in its more experimental genres. These performances are usually quite different from those seen in other types of popular music, though. The artists do not play any sort of standard instrument; instead, they manipulate studio technology and software in a real-time environment. (An extreme example occurred at the 2001 Detroit Electronic Music Festival, when artist Nobukazu Takemura and another musician performed solely on laptop computers.) Another difference is that many EDM artists create new works when performing rather than attempting to recreate their recorded works. 18. This contrasts with the example given by Headlam, in which a meter is definitively established before the introduction of an antimetrical layer. Covach also argues for a clear distinction between metrical and antimetrical layers in the first presentation of the dissonance he discusses (Covach, “Progressive Rock,” 11 and 13). 19. Steve Reich, “Non-Western Music and the Western Composer,” Analyse musicale 11 (1988), 49. 20. Cf. Simha Arom, “Time Structure in Music of Central Africa: Periodicity, Meter, Rhythm, and Polyrhythmics,” Leonardo 22 (1989), 91. 21. Christopher Hasty, Meter as Rhythm (New York: Oxford University Press, 1998), 3. 22. Cf. Gretchen Horlacher, “Multiple Meters and Metrical Processes in the Music of Steve Reich,” Intégral (forthcoming), 2, where this point is made with respect to minimalist (as opposed to more generally “minimal”) music. 23. In EDM, measures usually consist of either eight eighth-note or sixteen sixteenth-note pulses; measure lengths of eight, nine, twelve, or sixteen pulses are common in African music. In both repertoires, however, the number of attacks articulating an asymmetrical pattern is usually an odd number, such as 3, 5, or 7. See Jay Rahn, “Asymmetrical Ostinatos in Sub-Saharan Music: Time, Pitch, and Cycles Reconsidered,” In Theory Only 9.7 (1987), 27–28, for a listing of some of the patterns that commonly occur in African music. 24. In turning to this body of scholarship, I am not attempting to suggest a relationship of influence between West African percussion music and electronic dance music. Rather, I consider this literature because it addresses a musical characteristic shared by the two repertories. While I personally believe that EDM probably has been influenced by African music, either directly (e.g., through musicians’ experiences with African music) or indirectly (e.g., through African-American musical traditions), to consider this possibility in detail would take us well beyond the scope of this paper. 25. Robert Kaufman, “African Rhythm: A Reassessment,” Ethnomusicology 24 (1980), 394. Other scholars who argue for the existence of irregularly spaced beats in African music include Ruth Stone and Rose Brandel. See Ruth M. Stone, “In Search of Time in African Music,” Music Theory Spectrum 7 (1985), 139–48; and Rose Brandel, The Music of Central Africa (The Hague: Martinus Nijhoff, 1961). 26. For instance, see Richard Waterman, “African Influence on the Music of the Americas,” in Acculturation in the Americas (Proceedings of the 19th International Congress of Americanists), ed. Sol Tax (Chicago: University of Chicago Press, 1952), 207–18; J. H. Kwabena Nketia, The Music of Africa, (New York: W. W. Norton, 1974); and David Locke, “Principles of Offbeat Timing and Cross-Rhythm in Southern Eve Dance Drumming,” Ethnomusicology 26.2 (1982), 217–46. 27. Fred Lerdahl and Ray Jackendoff, A Generative Theory of Tonal Music (Cambridge, MA: MIT Press, 1983), 69. Lerdahl and Jackendoff do posit these rules as idiom-specific, however, and acknowledge (97) that “certain other metrical idioms have more complex rules in place of MWFR4, permitting structured alternation of different-length metrical units.” (MWFR4, or Metrical Well-Formedness Rule 4, is the second of the rules given above.) Nonetheless, they address these idioms only briefly, and this exception is rarely mentioned in applications of their work. 28. See David Temperley, “Meter and Grouping in African Music: A View from Music Theory,” Ethnomusicology 44.1 (2000), 65–96, and “Syncopation in Rock: A Perceptual Perspective,” Popular Music 18.1 (1999), 19–40. Although there are similarities between the GTTM approach and some of the views of meter expressed by ethnomusicologists, I would disagree with Temperley’s assertion that “there is almost unanimous agreement” among ethnomusicologists that African music has meter as defined by Lerdahl and Jackendoff (Temperley, “Meter and Grouping in African Music,” 68; see also 76). In fact, scholars present very diverse opinions on meter and rhythm in this music; even those who seem to share the same general view often differ markedly on various points. Furthermore, due to an unfortunate lack of intellectual exchange between music theory and ethnomusicology—a situation that has only begun to change quite recently—it is difficult to make claims that relate ethnomusicological views of meter to specific music-theoretical ones with any certainty. In his 1999 paper, Temperley argues that syncopations in rock can be understood as displacements from specific positions in a metrical grid. While this is helpful in showing how Lerdahl and Jackendoff’s model might be extended to highly syncopated repertoires, it will not be discussed at length here, as it is not especially applicable to situations like the one presented above for several reasons: first, it is based on textual accentuation, which is rarely a factor in EDM; second, in all of the examples considered by Temperley, the accompanying instruments clearly convey an evenly spaced metrical structure; and third, none of Temperley’s examples contain regularly recurring asymmetrical patterns like the ones shown in Example 4e. 29. Kaufmann, “African Rhythm,” 394; Stone, “In Search of Time,” 140. 30. Temperley notes a similar problem with respect to Lerdahl and Jackendoff’s theory. In their approach, patterns that dissonate with the meter are simply described as syncopated; the ways in which syncopation functions remain relatively untheorized. Temperley, “Syncopation in Rock,” 25–26. 32. Rahn, “Asymmetrical Ostinatos,” 25. 33. Arthur M. Jones, Studies in African Music, (London: Oxford University Press, 1959), 20–21. 34. This general observation may be less applicable to subgenres that feature vocals or instrumental solos. In such cases, the voice or solo instrument may function as a rhythmic and textural “figure” against an accompanimental metrical “ground,” and Temperley’s rock-based model of syncopation may be more applicable. 35. Headlam, “Blues Transformations,” 87. Headlam ultimately concludes that either approach may be relevant for different songs and even within the same song. 36. Rahn, “Asymmetrical Ostinatos,” 25–26. 37. See Rahn, “Asymmetrical Ostinatos,” and “Turning the Analysis Around: African-Derived Rhythms and Europe-Derived Music Theory,” Black Music Research Journal 16.1 (1996), 71–89. Another important article adopting a similar approach is Jeff Pressing, “Cognitive Isomorphisms between Pitch and Rhythm in World Musics: West Africa, the Balkans and Western Tonality,” Studies in Music 17 (1983), 38–61. 38. John Clough and Jack Douthett, “Maximally Even Sets,” Journal of Music Theory 35.1 (1991), 93–173. 39. In this paragraph I use Rahn’s term “diatonic rhythms” in place of “asymmetrical patterns”; describing the rhythm provided as an example (2+1+2+1+2) as “asymmetrical” is problematic, since its durations form a palindrome. In both “Compression” and “Pearls Girl,” however, this pattern is treated as a variant of 3+3+2, which clearly divides the measure asymmetrically. In fact, all of the diatonic rhythms I have observed in EDM are either literally asymmetrical or are grouped asymmetrically. Rahn himself includes 2+1+2+1+2 in a list of “asymmetrical ostinatos” in his 1987 paper (see pages 27–28), though he replaces this term with “diatonic rhythms” in his 1996 article. Since my paper as a whole is not about the “diatonic” aspects of these rhythms, I will continue to use the term “asymmetrical patterns” throughout the article. 40. Rahn, “Turning the Analysis Around,” 79–80. 41. Stephen Handel, “The Interplay between Metric and Figural Rhythmic Organization,” Journal of Experimental Psychology: Human Perception and Performance 24.5 (1998), 1546–61. 43. Handel first demonstrated this point in “The Differentiation of Rhythmic Structure,” Perception and Psychophysics 52 (1992), 492–507. 44. Although Handel presents a wide variety of weakly metric rhythms, he does not focus specifically on the figural properties of asymmetrical patterns. This is certainly a promising topic for future research, however. He does in fact single out the rhythm found in “Cubik”, 3+3+3+3+4 (or X..X..X..X..X...), for special comment, noting that it differs from the other rhythms in his study in that it is comprised entirely of single-tone figures (its figural organization is 1-1-1-1-1-; Handel, “Metric and Figural Rhythms,” 1559). This attribute suggests an interesting relationship to the maximal evenness discussed by Rahn. 45. Hasty, Meter as Rhythm, 84–86. 48. Another work that should be mentioned in this regard is Gretchen Horlacher’s article “Bartok’s ‘Change of Time’: Coming Unfixed,” Music Theory Online 7.1 (2001). Horlacher claims that the processive approach suggested by Hasty is “especially relevant for music that is vitally ‘irregular,’ for it values such irregularities as capable of shaping the essential nature of time within the context of a given piece” (paragraph 4.1). 49. While figural hearing might seem incompatible with Hasty’s emphasis on the projection of specific durations, I would argue that it could still be posited as an additional mode complementary to projective hearing. Furthermore, Handel’s characterization of meter as “emergent” (“Metric and Figural Rhythms,” 1560) also resonates with Hasty’s approach. Hasty does in fact discuss research by Handel (see Meter as Rhythm, 124–25 and 173), though the passages cited do not address figural organization in particular. 51. Though (as I will argue in the concluding paragraph) further research is necessary to answer these questions fully, I would like to comment briefly on the issues raised in this sentence. As discussed above (paragraphs 10-15), the phenomena addressed in this paper are not limited to EDM, though their manifestations within it are part of a distinctive constellation of features. Regarding the various genres of EDM itself, I believe that the research presented here can be applied to a broad cross-spectrum of the music, though as I have noted elsewhere, certain features may be more applicable to some genres than others. In selecting the musical examples presented here, I have chosen works from relatively well-known artists with the intent of making the paper more accessible. The artists represented incorporate a variety of genres into their work. The Chemical Brothers are most commonly classified as “big beat,” a term referring to dance music that incorporates some of the song structures and sonic elements of rock and hip-hop (though I believe this aspect of their work has been overemphasized). Everything But the Girl have a long history that has only recently (ca. 1995) begun to include EDM elements; since then, however, they have collaborated with many prominent dance musicians and have successfully incorporated a variety of EDM styles into their work. Underworld (who recently disbanded) are difficult to place within a particular genre, as their individualistic sound shows the influence of techno, deep house, breakbeat, and dub; however, their music has often been characterized broadly as techno (for instance, see Dom Phillips, “Underworld,” in The Rough Guide to Techno [London: The Rough Guides, 2000]). In spite of the commercial success of these artists and the fact that some of their work includes elements of other popular music genres, I have avoided work that might be considered “crossover” (such as The Chemical Brothers’ collaborations with Oasis and other pop musicians), and I believe that the music included here represents trends central to EDM. 52. Many of these questions will in fact be addressed in my doctoral dissertation, “A Study of Rhythm and Meter in Electronic Dance Music, with a Consideration of the Enactment of These Features in Dance” (Indiana University, in progress). These particular quotations are taken, respectively, from the following articles in the Detroit Free Press describing the 2001 Detroit Electronic Music Festival: David Lyman, “Detroit Dance Fever,” 28 May 2001, C6; Brian McCollum, Tim Pratt, and Tamara Warren, “Techno and Torrents in Hart Plaza,” 28 May 2001, C6; and Brian McCollum, “Unbeatable,” 29 May 2001, D3. Similar ambiguities have been explored by the psychologist Stephen Handel, who has studied the cognition of polyrhythms such as two against three, two against five, and so on. In a series of experiments, Handel and co-researcher James Oshinsky played selected polyrhythms for listeners and asked them to tap along with what they perceived to be the beat; their results suggest that certain combinations encourage a variety of beat placements. See Stephen Handel and James S. Oshinsky, “The Meter of Syncopated Auditory Polyrhythms,” Perception and Psychophysics 30.1 (1981), 1–9. Harald Krebs, Fantasy-Pieces: Metrical Dissonance in the Music of Robert Schumann (New York: Oxford University Press, 1999), 33. Krebs describes the type of polyrhythm discussed by Handel as a grouping dissonance. This type consists of layers whose cardinalities differ (for instance, a 3-layer against a 5-layer), whereas a displacement dissonance always involves two or more layers of the same cardinality (ibid., 31). Maury Yeston, The Stratification of Musical Rhythm (New Haven: Yale University Press, 1976). Krebs does refer very briefly to such a situation, noting that “where there is no metrical framework, the layer initiated earlier usually functions as the referential layer” (ibid., 261, n. 20). While this principle seems plausible, it remains hypothetical within the context of Krebs’s book, as none of his examples fall into this category. Even if we do accept it, it is difficult to apply in this case, as both layers begin almost simultaneously and at a low volume. Krebs has concurred with my assertion that selective attention can change which layer functions as referential in this example (personal communication, May 2000). Krebs believes that most displacement dissonances are heard as forward displacements; thus, he usually expresses them with positive numbers—for example, D4+3 rather than D4-1 (ibid., 35–36). In this example, since there is no definitive metrical layer, this distinction is not especially relevant. At the same time, the increase in metrical consonance is counterbalanced by the syncopation of the new pitch pattern. Interestingly, if any other note within this pattern were taken as the downbeat, it would be considerably less syncopated; one such rearrangement is shown in Example 1c. Such a move, however, would shift the percussion parts onto weak sixteenth-note beats. It would be quite unusual for the bass drum to be syncopated in this manner; when present, it tends to function as a source of metrical stability in EDM, most likely due to its status as the lowest and most resonant element in the texture. Research in music cognition supports this claim (for instance, Handel and Oshinsky found that when the frequency between metrically dissonant elements varies, listeners tend to choose the lower frequency as stable; see “Syncopated Auditory Polyrhythms,” 4), as does observation of EDM in performance (when played at a typical performance volume, the bass drum will be felt throughout the entire body). Here I employ a distinction between conservative and radical listeners first suggested by Andrew Imbrie. (See Andrew Imbrie, “‘Extra’ Measures and Metrical Ambiguity in Beethoven,” in Beethoven Studies, ed. Alan Tyson [New York: Norton, 1973], 45–66.) When presented with conflicting cues, conservative listeners tend to hold onto previously established metrical interpretations for as long as possible, whereas radicals move on to new interpretations more readily. In Example 2b, a conservative hearing is supported by the lack of a strong downbeat orientation in the drumbeat pattern and by the fact that the articulations of this pattern occur on weak beats of the previously established meter; a radical hearing is supported by the previously mentioned tendency of low drumbeats to function as metrically stable in EDM (in contrast to cymbals, which usually function as backbeats) and by the fact that the drum pattern begins one eighth note before the synth and cymbal patterns (if the drum were the backbeat, its pattern would more logically begin on the “and” of beat one). Dave Headlam, “Blues Transformations in the Music of Cream,” in Understanding Rock: Essays in Musical Analysis, ed. John Covach and Graeme M. Boone (New York: Oxford University Press, 1997), 73–79. Headlam does not use the term “displacement dissonance”; this application of Krebs’s terminology is my own. See John Covach, “Progressive Rock, ‘Close to the Edge,’ and the Boundaries of Style,” in Understanding Rock 11–14. It should be noted, however, that Covach’s examples differ from those previously cited, in that (in Krebsian terms) they would be considered grouping rather than displacement dissonances. (As before, the application of Krebs’s terminology is my own rather than the author’s, though Covach does use the term “metric dissonance.”) While displacement dissonances are quite common in electronic dance music, grouping dissonances are relatively rare. For instance, see Cynthia Folio, “An Analysis of Polyrhythm in Selected Improvised Jazz Solos,” in Concert Music, Rock, and Jazz since 1945: Essays and Analytical Studies, ed. Elizabeth West Marvin and Richard Hermann (Rochester, NY: University of Rochester Press, 1995), 103–34. Folio finds examples of both grouping and displacement dissonances (which she refers to as type A and type B dissonances, following an earlier usage of Krebs), as well as a third type (type C) involving out-of-phase tempos. Cf. Covach, “Progressive Rock,” 14. For the most part, however, Folio’s examples present a succession of distinct, short-lived dissonances, a feature that distinguishes them from Covach’s examples (in which considerable time intervals separate appearances of related dissonances) and from EDM (in which a single dissonance often repeats continuously for a long period of time). There are a few notable exceptions to this trend: certain styles of house music feature vocals quite prominently; drum-n-bass/jungle DJs sometimes perform in conjunction with rappers (MCs); and “crossover” artists such as Moby are also more likely to utilize vocals. Nevertheless, the above statement holds true for the majority of electronic dance music; it is quite common to hear several hours worth of music at an EDM performance without encountering a single vocal. Furthermore, the exceptions to this phenomenon tend to push toward or be classified as other genres; for instance, certain performers are classified as crossover acts because their vocally driven songs are seen as moving toward the style and structure of radio-friendly pop. DJs also play an important role in certain other genres, such as rap and turntablism. Rap in particular shares many aspects of EDM’s layered approach to musical construction, and layering has been emphasized in analytical approaches to rap as well. For instance, see Tricia Rose, Black Noise: Rap Music and Black Culture in Contemporary America (Hanover, NH: Wesleyan University Press, 1994); Robert Walser, “Rhythm, Rhyme, and Rhetoric in the Music of Public Enemy,” Ethnomusicology 39.2 (1995), 193–217; and Adam Krims, Rap Music and the Poetics of Identity (Cambridge: Cambridge University Press, 2000). Nonetheless, the absence of vocals, in combination with the more central role of the DJ, creates significant textural differences between EDM and rap. This contrasts with the example given by Headlam, in which a meter is definitively established before the introduction of an antimetrical layer. Covach also argues for a clear distinction between metrical and antimetrical layers in the first presentation of the dissonance he discusses (Covach, “Progressive Rock,” 11 and 13). Steve Reich, “Non-Western Music and the Western Composer,” Analyse musicale 11 (1988), 49. Cf. Simha Arom, “Time Structure in Music of Central Africa: Periodicity, Meter, Rhythm, and Polyrhythmics,” Leonardo 22 (1989), 91. Christopher Hasty, Meter as Rhythm (New York: Oxford University Press, 1998), 3. Cf. Gretchen Horlacher, “Multiple Meters and Metrical Processes in the Music of Steve Reich,” Intégral (forthcoming), 2, where this point is made with respect to minimalist (as opposed to more generally “minimal”) music. In EDM, measures usually consist of either eight eighth-note or sixteen sixteenth-note pulses; measure lengths of eight, nine, twelve, or sixteen pulses are common in African music. In both repertoires, however, the number of attacks articulating an asymmetrical pattern is usually an odd number, such as 3, 5, or 7. See Jay Rahn, “Asymmetrical Ostinatos in Sub-Saharan Music: Time, Pitch, and Cycles Reconsidered,” In Theory Only 9.7 (1987), 27–28, for a listing of some of the patterns that commonly occur in African music. In turning to this body of scholarship, I am not attempting to suggest a relationship of influence between West African percussion music and electronic dance music. Rather, I consider this literature because it addresses a musical characteristic shared by the two repertories. While I personally believe that EDM probably has been influenced by African music, either directly (e.g., through musicians’ experiences with African music) or indirectly (e.g., through African-American musical traditions), to consider this possibility in detail would take us well beyond the scope of this paper. Robert Kaufman, “African Rhythm: A Reassessment,” Ethnomusicology 24 (1980), 394. Other scholars who argue for the existence of irregularly spaced beats in African music include Ruth Stone and Rose Brandel. See Ruth M. Stone, “In Search of Time in African Music,” Music Theory Spectrum 7 (1985), 139–48; and Rose Brandel, The Music of Central Africa (The Hague: Martinus Nijhoff, 1961). For instance, see Richard Waterman, “African Influence on the Music of the Americas,” in Acculturation in the Americas (Proceedings of the 19th International Congress of Americanists), ed. Sol Tax (Chicago: University of Chicago Press, 1952), 207–18; J. H. Kwabena Nketia, The Music of Africa, (New York: W. W. Norton, 1974); and David Locke, “Principles of Offbeat Timing and Cross-Rhythm in Southern Eve Dance Drumming,” Ethnomusicology 26.2 (1982), 217–46. Fred Lerdahl and Ray Jackendoff, A Generative Theory of Tonal Music (Cambridge, MA: MIT Press, 1983), 69. Lerdahl and Jackendoff do posit these rules as idiom-specific, however, and acknowledge (97) that “certain other metrical idioms have more complex rules in place of MWFR4, permitting structured alternation of different-length metrical units.” (MWFR4, or Metrical Well-Formedness Rule 4, is the second of the rules given above.) Nonetheless, they address these idioms only briefly, and this exception is rarely mentioned in applications of their work. See David Temperley, “Meter and Grouping in African Music: A View from Music Theory,” Ethnomusicology 44.1 (2000), 65–96, and “Syncopation in Rock: A Perceptual Perspective,” Popular Music 18.1 (1999), 19–40. Although there are similarities between the GTTM approach and some of the views of meter expressed by ethnomusicologists, I would disagree with Temperley’s assertion that “there is almost unanimous agreement” among ethnomusicologists that African music has meter as defined by Lerdahl and Jackendoff (Temperley, “Meter and Grouping in African Music,” 68; see also 76). In fact, scholars present very diverse opinions on meter and rhythm in this music; even those who seem to share the same general view often differ markedly on various points. Furthermore, due to an unfortunate lack of intellectual exchange between music theory and ethnomusicology—a situation that has only begun to change quite recently—it is difficult to make claims that relate ethnomusicological views of meter to specific music-theoretical ones with any certainty. Kaufmann, “African Rhythm,” 394; Stone, “In Search of Time,” 140. Temperley notes a similar problem with respect to Lerdahl and Jackendoff’s theory. In their approach, patterns that dissonate with the meter are simply described as syncopated; the ways in which syncopation functions remain relatively untheorized. Temperley, “Syncopation in Rock,” 25–26. Arthur M. Jones, Studies in African Music, (London: Oxford University Press, 1959), 20–21. This general observation may be less applicable to subgenres that feature vocals or instrumental solos. In such cases, the voice or solo instrument may function as a rhythmic and textural “figure” against an accompanimental metrical “ground,” and Temperley’s rock-based model of syncopation may be more applicable. Headlam, “Blues Transformations,” 87. Headlam ultimately concludes that either approach may be relevant for different songs and even within the same song. See Rahn, “Asymmetrical Ostinatos,” and “Turning the Analysis Around: African-Derived Rhythms and Europe-Derived Music Theory,” Black Music Research Journal 16.1 (1996), 71–89. Another important article adopting a similar approach is Jeff Pressing, “Cognitive Isomorphisms between Pitch and Rhythm in World Musics: West Africa, the Balkans and Western Tonality,” Studies in Music 17 (1983), 38–61. 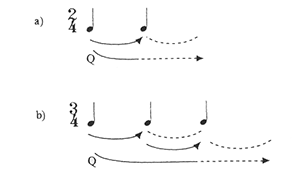 John Clough and Jack Douthett, “Maximally Even Sets,” Journal of Music Theory 35.1 (1991), 93–173. In this paragraph I use Rahn’s term “diatonic rhythms” in place of “asymmetrical patterns”; describing the rhythm provided as an example (2+1+2+1+2) as “asymmetrical” is problematic, since its durations form a palindrome. In both “Compression” and “Pearls Girl,” however, this pattern is treated as a variant of 3+3+2, which clearly divides the measure asymmetrically. In fact, all of the diatonic rhythms I have observed in EDM are either literally asymmetrical or are grouped asymmetrically. Rahn himself includes 2+1+2+1+2 in a list of “asymmetrical ostinatos” in his 1987 paper (see pages 27–28), though he replaces this term with “diatonic rhythms” in his 1996 article. Since my paper as a whole is not about the “diatonic” aspects of these rhythms, I will continue to use the term “asymmetrical patterns” throughout the article. Rahn, “Turning the Analysis Around,” 79–80. Stephen Handel, “The Interplay between Metric and Figural Rhythmic Organization,” Journal of Experimental Psychology: Human Perception and Performance 24.5 (1998), 1546–61. Handel first demonstrated this point in “The Differentiation of Rhythmic Structure,” Perception and Psychophysics 52 (1992), 492–507. Although Handel presents a wide variety of weakly metric rhythms, he does not focus specifically on the figural properties of asymmetrical patterns. This is certainly a promising topic for future research, however. He does in fact single out the rhythm found in “Cubik”, 3+3+3+3+4 (or X..X..X..X..X...), for special comment, noting that it differs from the other rhythms in his study in that it is comprised entirely of single-tone figures (its figural organization is 1-1-1-1-1-; Handel, “Metric and Figural Rhythms,” 1559). This attribute suggests an interesting relationship to the maximal evenness discussed by Rahn. Hasty, Meter as Rhythm, 84–86. Another work that should be mentioned in this regard is Gretchen Horlacher’s article “Bartok’s ‘Change of Time’: Coming Unfixed,” Music Theory Online 7.1 (2001). Horlacher claims that the processive approach suggested by Hasty is “especially relevant for music that is vitally ‘irregular,’ for it values such irregularities as capable of shaping the essential nature of time within the context of a given piece” (paragraph 4.1). While figural hearing might seem incompatible with Hasty’s emphasis on the projection of specific durations, I would argue that it could still be posited as an additional mode complementary to projective hearing. Furthermore, Handel’s characterization of meter as “emergent” (“Metric and Figural Rhythms,” 1560) also resonates with Hasty’s approach. Hasty does in fact discuss research by Handel (see Meter as Rhythm, 124–25 and 173), though the passages cited do not address figural organization in particular. Though (as I will argue in the concluding paragraph) further research is necessary to answer these questions fully, I would like to comment briefly on the issues raised in this sentence. As discussed above (paragraphs 10-15), the phenomena addressed in this paper are not limited to EDM, though their manifestations within it are part of a distinctive constellation of features. Regarding the various genres of EDM itself, I believe that the research presented here can be applied to a broad cross-spectrum of the music, though as I have noted elsewhere, certain features may be more applicable to some genres than others. In selecting the musical examples presented here, I have chosen works from relatively well-known artists with the intent of making the paper more accessible. The artists represented incorporate a variety of genres into their work. The Chemical Brothers are most commonly classified as “big beat,” a term referring to dance music that incorporates some of the song structures and sonic elements of rock and hip-hop (though I believe this aspect of their work has been overemphasized). Everything But the Girl have a long history that has only recently (ca. 1995) begun to include EDM elements; since then, however, they have collaborated with many prominent dance musicians and have successfully incorporated a variety of EDM styles into their work. Underworld (who recently disbanded) are difficult to place within a particular genre, as their individualistic sound shows the influence of techno, deep house, breakbeat, and dub; however, their music has often been characterized broadly as techno (for instance, see Dom Phillips, “Underworld,” in The Rough Guide to Techno [London: The Rough Guides, 2000]). In spite of the commercial success of these artists and the fact that some of their work includes elements of other popular music genres, I have avoided work that might be considered “crossover” (such as The Chemical Brothers’ collaborations with Oasis and other pop musicians), and I believe that the music included here represents trends central to EDM. Many of these questions will in fact be addressed in my doctoral dissertation, “A Study of Rhythm and Meter in Electronic Dance Music, with a Consideration of the Enactment of These Features in Dance” (Indiana University, in progress). Copyright © 2001 by the Society for Music Theory. All rights reserved.